Congratulations to Victorino Torres, 2010 APPT Macau Champion (3,246,200 HKD)! Victorino Torres has been crowned champion of the PokerStars.net APPT Macau Main Event. After four days of poker at the glamorous Grand Lisboa hotel and casino, Torres outlasted 341 other players to take home 3,246,200 HKD, equivalent to around $416,046. Torres started the day seventh in chips. In interviews before the final table started, he said that was exactly the position he wanted. Clearly, he's dangerous with a short stack. He'd come back from just 2,500 chips on Day 1 and was forced to rebuild again after being knocked back to seven big blinds on Day 3. But he never counted himself out, and after raking in a few big pots, proved he could be just as dangerous with the chip lead. Torres brought the win home for the Northern Mariana Islands, defeating two players from Denmark and one each from Hong Kong, Norway, Costa Rica, the United States, and the United Kingdom. This is by far the amateur's biggest score, and now perhaps he'll have to reconsider his day job as an attorney to become more of a fixture on the tournament scene. Torres had to wade through a tough field to earn his title. Pros Kai Paulsen and Albert Kim finished seventh and eighth at the final table. Binh Ngyyen, who won APPT Manila less than two months ago, finished 13th, and Team PokerStars Pro Marcel Luske earned his first cash in Asia with his 27th-place finish. Want to be the next APPT champion? APPT Auckland will take place in New Zealand in September. As for us, we'll see you right here on PokerNews for the World Series of Poker in less than a week! 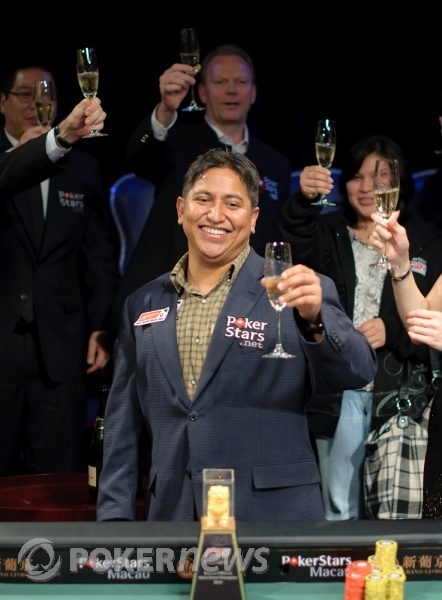 From the button, Chong Cheong raised to 125,000 and Victorino Torres called from the big blind. The flop came down with the and fireworks ensued. Torres checked and Cheong immediately shoved his 1.8-million-chip stack into the middle and was met with a snap-call from Torres, who flopped the low straight with the . Cheong held the for an up-and-down straight draw. With the cameras flashing, film rolling and crowd cheering, the turn card was dealt the . Torres dodged one street and had one more to go to become champion. The dealer burned and then dealt the river card, smacking the on the felt. Torres' arms shot into the air as he knew it was all over. Cheong was left with 2nd-place money and a runner-up finish. The hand after Chong Cheong's double up, Victorino Torres let him see a flop for the minimum. It came , and Torres folded. Cheong bet 100,000, and Torres folded. Victorino Torres moved all in from the button and Chong Cheong snap-called. Cheong held the and Torres the . The crowd jumped up as our first all-in situation with a showdown occurred. The flop came down with the in the window, but behind that was the and to give Cheong two pair and the lead. Torres asked the dealer for a ten on the turn, but the gave Cheong a full house and sealed the deal for his double up. The river completed the board with the . The pot was worth 1.93 million and that's how much Cheong has now. Torres is still in the lead with about 4.8 million. Victorino Torres took down the fourth pot of heads up with a bet on the flop. 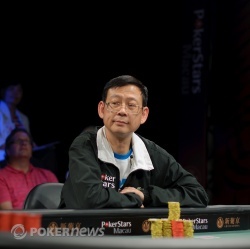 The fifth, Chong Cheong completed his small blind, and Torres moved all in, taking 50,000 from Cheong. The sixth, Torres moved all in from the small blind and took Cheong's big blind. From the button, chip leader Victorino Torres limped in. Chong Cheong raised to 175,000 from the big blind and Torres made the call. 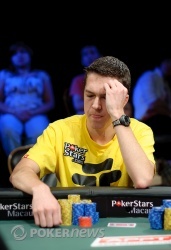 The two players took a flop of and Cheong fired 400,000 with four tall stacks of yellow chips. Torres thought for a minute or so beofre he began to stack the larger-denomination red chips in front of him. He then stuffed them into the middle and announced that he was all in. Cheong went into the tank while everyone around the final table arena stood up in anticipation. Eventually, he announced a fold, but many people thought he said call. Cheong doesn't speak very good English and can be easily mistaken. It was a false alarm and the chips were sent Torres' way. He's now up to about 5.7 million and Cheong was left with just one million. Torres did show the from his holecards meaning he held at least a pair of aces. The first hand of heads up went to chip-leader Victorino Torres. He bet 200,000 at the flop, and Chong Cheong called. Torres fired half a million chips after the turn, and that was enough to scare Cheong away. Victorino Torres and Chong Cheong are taking a few minutes to stroll around the table and chat with the railbirds while the staff prepares the table for heads-up play. This shouldn't take long, don't wander off on us. Torres has 4.8 million to Cheong's 1.9 million. Twenty-year old Cole Swannack fell victim to a trap laid by the table's elder statesman, Chong Cheong. Cheong completed his small blind, and Swannack moved all in for a little over 900,000. Snap-call from Cheong with . Things didn't look good for Swannack's . The board failed to bring Swannack a Cada-esque miracle and relegated the kid from New Zealand to elimination in third place.